I know the code applies to 100's of items, so this may annoy some people. 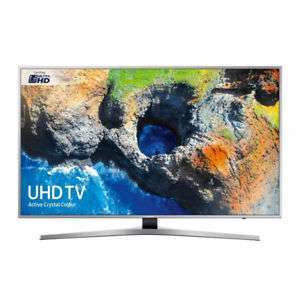 I was on the lookout for a really good value 4K TV, and this is well regarded at the original retail price of £499. With code PARTY 20 it can be had for £372! Hard to beat I reckon. Someone postedlast night that the 49 inch panel of this model has issues. Yup, this is the one that everyone says had light bleed issues... I think the 55" and up (if they exist) are OK, but not this size. Otherwise I'd be all over this. Any of our resident TV experts care to comment? Voted Hot, but the issues are stopping me from buying. Is the 55’ one alright ? I've ordered, but noticed for £30 more I can get the Panasonic TX50EX700B, is this a better buy? I've ordered, but noticed for £30 more I can get the Panasonic TX50EX700B, …I've ordered, but noticed for £30 more I can get the Panasonic TX50EX700B, is this a better buy? Apparently so. I'm in the same boat. Need a 49/50 incher, anything else is too big. You could have got the Panny for 399 price matched by JL last week I think. Lack of warranty here is a thing. Is there any good deals on the 40" version of this before they arent sold anymore? Looking for a second desktop monitor. I had to return this model twice due to bleeding issues. Settled for the 40" model in the end as it uses a VA panel. Apparently so. I'm in the same boat. Need a 49/50 incher, anything else is …Apparently so. I'm in the same boat. Need a 49/50 incher, anything else is too big.You could have got the Panny for 399 price matched by JL last week I think. Lack of warranty here is a thing. Yep, I was going to buy the 55 inch version but I really think you need a 5 year warranty with current TV technology, especially when you get to bigger sized panels. £400 to £500 is a lot to pay if something fails 12 months + 1 day. Yep, I was going to buy the 55 inch version but I really think you need a …Yep, I was going to buy the 55 inch version but I really think you need a 5 year warranty with current TV technology, especially when you get to bigger sized panels. £400 to £500 is a lot to pay if something fails 12 months + 1 day. Well, extra warranty have long been the dirty big profit secret for shops in the UK when buying any kind of electronic gadget. You would be better off, as you no doubt know, spending that money buying a better TV from JL with a good 5 year warranty. It is a shame with Hughes as it is a great deal but 12 months is not good enough as so many of these modern TV's have longevity issues. I was watching a youtube review of this range of TV's last night and apparently the previous year's version had problems with the back of the TV's separating from the front due to heat after several months. I also think that we are about to move to OLED being pre-dominant in the shops by Christmas. The manufacturers will be wanting to get rid of the non-OLED stock and hoping that they do so during this World Cup. I have no evidence to back this up but I have a sneaky feeling that the World Cup is not producing the sales that both the manufacturers and shops were hoping for. So, perhaps, in a few weeks time we will see some really good TV deals. ordered samsung UE50MU6120 from john lewis yesterday which is being delivered end of the month i got it for £379 with RGB price match. Prices have really come down, paid £600 for the equivalent of this one 2 years ago. I'm waiting for the 65" prices to come down though. Apparently some of those Sharp TVs which Tesco have been selling off, which are are apparently pretty unreliable, have a 5 year warranty. I have the 49"...it has some light bleed but not even sure I would have noticed if I wasn't looking for it ...dark room and black bars on the pic and it is there for sure...however otherwise really good set. Just ordered th 55" too...so hopefully bleed isn't a problem on that. Does the Panny above have more than 1 year warranty? I got 2 mu6120? for £380 each at Xmas. Way better than last years 40ku6020? for £300 Tesco. Prob has light bleed but never noticed. Motion is great, but could be better for fast moving stuff. This one looks to be 1500pqi compared to 1300pqi. I have the 49"...it has some light bleed but not even sure I would have …I have the 49"...it has some light bleed but not even sure I would have noticed if I wasn't looking for it ...dark room and black bars on the pic and it is there for sure...however otherwise really good set. Just ordered th 55" too...so hopefully bleed isn't a problem on that. Does the Panny above have more than 1 year warranty? Let us know how you get on with the 55in all the negative feedback about light bleed puts me off, I sent back a hisense because it looked horrendous at night in dark room. Watching on this TV right now, honestly I’ve always been really impressed with it. The apps can get slow to load after a while but picture quality is incredible. Such a great price. Crazy to think I paid £589 for the 49" mu6500 (curved version of this) just 9 months ago and though that was a good price.. If anyone is yet to get a 4K HDR TV, don't hesitate! Worth every penny at this price. Got mine in the previous eBay deal via Co-Op, with a JL pricematch. That was £430 which I thought was good, so this is an excellent offer. Installed mine yesterday (wall-mounted) and very happy with it. Did lots of testing and have absolutely no light bleeding issues. Light bleed is only a problem if you have one with an IPS panel. Most have VA panels and look great for the price. Light bleed is only a problem if you have one with an IPS panel. Most have …Light bleed is only a problem if you have one with an IPS panel. Most have VA panels and look great for the price. It's kinda wrong to have two type's of panel for same model size. How will I know which one I get. From where JL matched last week? RGB direct? Yeah, I'm pretty sure that was the one. The guy above will know! The code doesn't apply to Hughes website. only there eBay shop which JL Won't match. Mine came today and there doesn't seem to be any light bleed issues but it's bright at the moment, I will have more idea in a dark room tonight.